It's time to get your game on in this unique spelling game. Spill and Spell is all about being creative with the letters you are given. Start off by spilling the 22 letter-dice onto the table and start trying to come up with intersecting words that will have you claiming victory. In the game of Spill and Spell you can put the dice together vertically, horizontally, or diagonally to spell as many words as you can. Did you run out of options? Try spilling the remaining letters again to find even more words. Players with longer words will score higher points. The player with the most points wins the fun game of Spill and Spell. Try playing Spill and Spell with your family or friends today! To win the game of Spill and Spell you must get the most points by creating words with the face-up letters on your dice. The longer the word, the higher the score per letter. 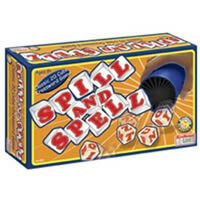 The player to get the most points wins the game of Spill and Spell! Your Spill and Spell game should come with 22 letter dice, one-minute timer, cup for shaking and spilling, score pad, pencil, and the official Spill and Spell rules and instructions. Please keep in mind that the official Spill And Spell party rules and instructions could be different depending on the game version you have. The rules below are some of the exact directions on how to play Spill And Spell. Share with us your comments, funny stories, tips, advice, strategies, creative ways to play, questions about how to play, problems with the rules or anything you want about Spill And Spell. All submissions will be reviewed within 24 hours. Click here to add your Spill And Spell comments. I am missing one dice in spill and spell. I believe it has the letters X Z F K Q J, and perhaps instead of a Z it might have a U. Can anyone tell me if this is correct?